Hey! I’m posting over at Proverbs 31 Ministries today! I thought you might enjoy this post too. God is crazy about you! Don’t forget it! The first time I eyed him, he was sitting on the floor at a friend’s Bible study with his back against the wall, dressed in scruffy jeans and a red flannel shirt with the sleeves rolled halfway up his muscular forearms. His thick brown hair and chocolate-brown eyes left me weak in the knees. And the best part was that this handsome man (whom I eventually married) had a tattered Bible in his lap. I was smitten from the first time I laid eyes on Steve. Looking back on those early days, what I was really saying was that I wanted to be pursued. None of this blanket-invitation-for-the-entire-season business. I wanted to be wooed and won. Even though he had me the moment I saw him sitting on the shag carpet, I didn’t want him to know that. I wanted him to show me I was worth putting forth the effort to capture my heart. Isn’t that the desire of every human heart? And nobody does it better than God. The entire Bible, from Genesis 1 to Revelation 22:21, is a record of God’s passionate pursuit of the human heart. Click & Tweet! We end the last chapter of the Old Testament with silence. And then 400 years later, God breaks the holy hush with the cry of a babe in a manger as the story picks back up in Bethlehem. God has pulled out all the stops to pursue you and me. Moved heaven and earth — literally — to win us back, to reestablish the glory that was lost in the Garden. Most of us feel that we have to pursue God continually, as if He were hard to find. And as long as we believe that, our faith journey will be difficult. It will be arduous. After all, Jesus reminded us, “Come to me all you who are weary and burdened, and I will give you rest. Take my yoke upon you and learn from me, for I am gentle and humble in heart, and you will find rest for your souls. For my yoke is easy and my burden is light” (Matthew 11:28-30, NIV). And yet, easy and light are not words that come quickly to mind when most think of their faith journey. God is wooing us, stirring us, awakening a longing for Him in our souls. Jesus said, “No one can come to me unless the Father who sent me draws them” (John 6:44a, NIV). He tunes the violin and pulls the bow across the strings of your heart and waits for you to recognize the melody wooing you into relationship with Him. Because you’re reading this devotion, He knows you’re listening. I have been in an all-out pursuit of God for most of my adult life. But when He turned my telescope around, the truth became clear. I had it all wrong. He was much too small, and I far too big. I began to see He was the one pursing me with an outstretched hand, inviting me to live and move and have my being in Him. And friend, God is pursuing you, too! What’s the key to experiencing God’s passionate pursuit? It’s simple, really. We must recognize and acknowledge His presence as we live and move and have our being in Him. Acts 17:28 must be more than a nice Bible verse; it must become a way of life. When it does, sudden glory moments where we recognize His presence will fill our lives and take our breath away. It is a divine romance of the purest kind. Dear Father, thank You for pursuing me more fervently and passionately than anyone else ever will. As You continue to woo my heart every day, help me come to You and be overwhelmed with the expanse of Your love. In Jesus’ Name, Amen. Do you long for more in your relationship with God? Thankfully, “something more” doesn’t mean “doing more.” God simply wants you to enjoy an intimate, personal, ongoing relationship with Him. But how do you do that? 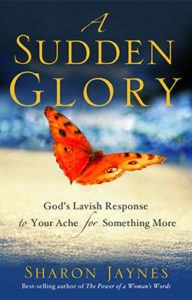 Sharon Jaynes’ book, A Sudden Glory: God’s Lavish Response to Your Ache for Something More, shows you how to erase the line between the secular and the sacred, so life becomes an act of worship. Yes, even doing the laundry! 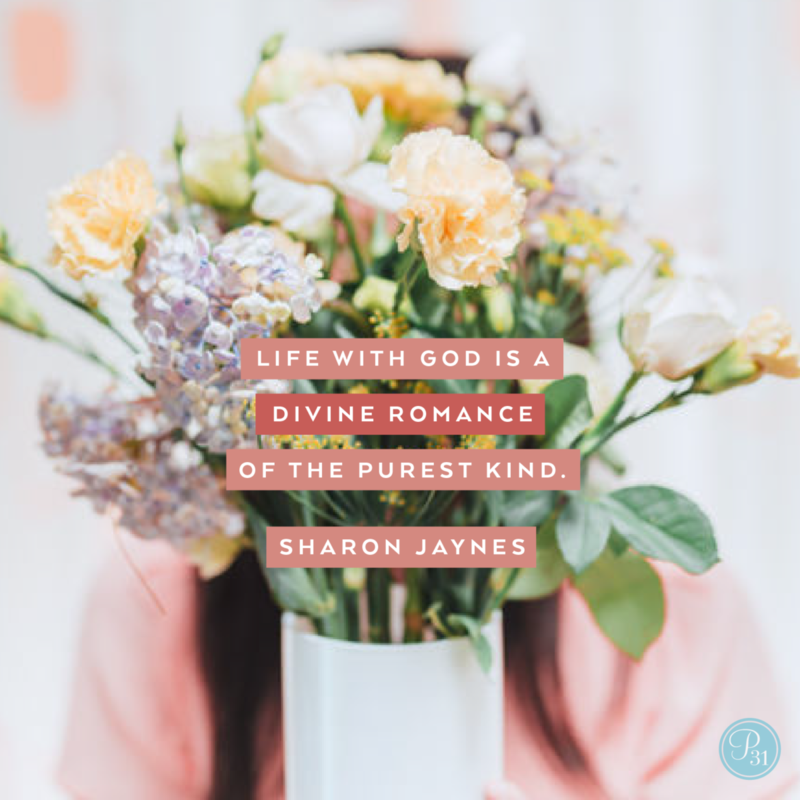 Sharon, “being wooed by God, being stirred, and awakening a longing for Him in my soul”, that is so beautifully written. The picture of God with His outstretched hand inviting me to ‘live, move, and have my being in Him. It opened up another side of our multidimensional savior, redeemer, restorer. Let us reach for that hand with joy and adoration! I long to be pursued by my husband. He returned to me and our family after years of adultering and having children with his mistress. Lately, he confessed of his status (though I already know through varied sources the Lord allowed me to discover). He sought forgiveness and I forgave him. He continued to see his other family for the sake of the kids. Recently, his kids and my kids and me met. It was God’s grace that strengthed me and caused me to accept them and love them for the sake of my husband. Still I long to be pursued and wooed by my husband. But…today, upon reading your article When you want to be pursued… I know the Lord has spoken to me once again… God has been pursuing me, more persistent than how my husband can and will do…and greater joy & fulfillment will He be able to give me if only I give in to His invitation. Forgive me Lord for ignoring You and exchanging moments with other things else; forgive me for making my other priorities as excuses to not spending more intimate moments with You, leaving me tired, exhausted, pity partying and grouchy. Help me to remember that You are pursuing me everyday and if I yield to You, the moments we spend together intimately are the sweetest and most fulfilling. I am so sorry you’ve had to go through such heartache. But you’re right. God has been and is pursuing you! You are sooooo precious to Him! so lovely, please can I talk you about personal problems.